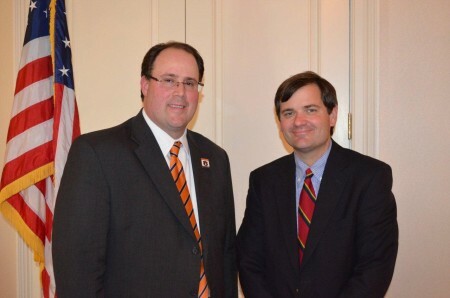 Rob Wellbaum, CFRE (left), Auburn University's interim vice president for development, spoke to the Auburn Rotary Club about the university's fundraising priorities, and the evolution of the Auburn University Foundation, campaigns and development operations. In his role with the university, Wellbaum also serves as president of the foundation, through which charitable giving to Auburn is received. Also pictured is club president David Reaves (right).